Access the Pathway here: http://www.thecdi.net/Career-Development These pages are currently being revised to take account of changes in roles and qualifications. Please contact claire.johnson@thecdi.net if you require further information. The Career Development sector is a thriving and diverse mix of career development practitioners. Our members provide activities and services at a range of different levels which help to motivate and empower individuals to make effective transitions in learning and work at all ages. 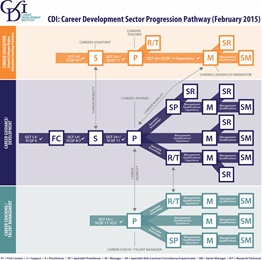 We were delighted to launch the first ever progression pathway for the career development sector in May 2015. To help employers, practitioners and members of the public identify not only the relevant qualifications which should be held for the different levels of role from first contact through to senior management but also understand the functions and the skills and knowledge required. The Pathway is one of the hallmarks of the profession, providing clarity for users, encouraging the development of practitioners and the inspiration to work towards the qualifications required for the UK Register of Career Development Professionals. It also shows the routes to more specialist practitioner, research and technical work roles and roles in lecturing, consultancy, inspection or management. Qualification levels and where career mobility is possible. The qualification levels are those which the CDI as the professional body recommend for the level of role. By clicking on each letter on the Map, accompanying information is accessed which shows the functions which need to be performed, the actual qualifications which are of relevance and sources of further information e.g. the full National Occupational Standards, Careers in Careers Jobs Board (formerly Portico), Training Events and Conferences and the Getting Qualified section of the CDI site. This information is quite detailed so two levels of information are provided with access to the second level by clicking on any of the coloured text. Clicking on the X will take you back to the Map. The National Occupational Standards: Career Development (NOS: CD) are used as the functions for each of the roles. These provide a common language for describing the skills, knowledge and understanding required for each of the roles. Every role in the sector is based upon a person performing varying combinations of the above. For the Managerial roles the National Occupational Standards in Management and Leadership are also used. As the sector continues to evolve the information can be amended easily as new qualifications become available, e.g. the Scottish SVQs in Enabling clients to access career development and Career Information, Advice and Employability Skills, and the Modern and Technical Apprenticeships.